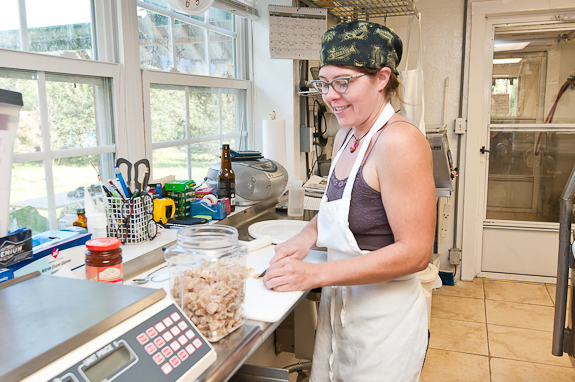 As many of you know, nothing is ever easy here at The Bunkycooks! After coming home to a flood in the front yard yesterday and paying a plumber $1000 (yes, that is the correct amount) to fix the broken pipe, I was finding it hard to see the humor in anything. However, I have gotten over it (although the bank account hasn’t) and was finally able to write this next article in the On The Road with Bunkycooks series! This time we traveled to Spinning Spider Creamery in Madison County, North Carolina! Yes, we really are traveling in an RV! You might remember (if you have been reading Bunkycooks), that I first saw Spinning Spider Creamery cheeses at the Asheville City Farmers’ Market. So, when I wanted to prepare an appetizer made with goat cheese, I said NAAA to buying the cheese at Publix and decided we would pay this dairy farm a visit and go shopping there! You know that we always do things the hard way things with a twist, therefore, it was far better to get fresh goat cheese right from the source! So we hopped in the ginormous RV (more on that later) and off we went! 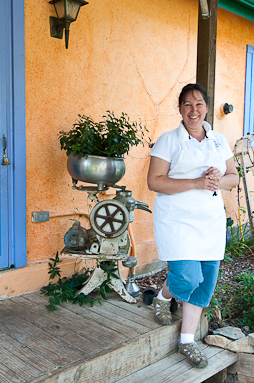 We met with Chris Owens, who with her husband Jeff, is the owner of Spinning Spider Creamery. 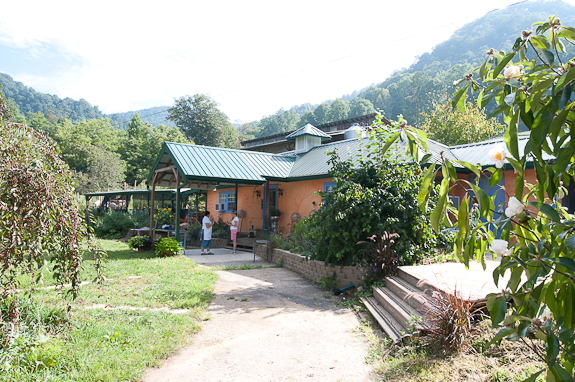 This farm is situated on five acres nestled in a mountain cove on Bailey Mountain. You may be wondering (as I was), what on earth would cause you to start a goat farm (besides the fact that the goats are pretty darn cute). A little bit of Provence in North Carolina! I will tell you why! This began as a 4H project for the Owens family because their three children were allergic to cow’s milk. What started as a small family project with a few goats while homeschooling their children, has turned into a full-time family business with seventy-five goats! Chris said that she grew up on a farm and showed horses, so a farming lifestyle was not new to her. They moved to this farm in 1999 and became licensed as a business in 2003. It is definitely a family operation. All of their children are involved and they are given an allowance for working on the farm. Chris says that it teaches them important skills, responsibility and accountability (I so agree). They also hope to be able to turn the business over to their children at some point in the future. We were graciously hosted by Chris for our tour of Spinning Spider Creamery. We saw where the goat’s milk goes into vats and where the cheeses are produced, then dried, aged and refrigerated. Chris showed us the Black Mountain Blue Cheese that was just made the day before we arrived. It has to be flipped every 15 minutes for two hours the day it is made and then then every three to five hours over the first twenty-four hours. After that, it’s brined, then pierced by hand and flipped every day for at least sixty days. It’s a good thing that they have those young kids to stay up all night and flip that cheese for the first day! This Black Mountain Blue Cheese requires lots of attention. We learned that that raw milk cheeses can legally be sold after sixty days, but that many of the cheeses require a much longer time to age. The cloth bound McChesney is their raw milk cheddar. The batch we saw will be ready in late December. By that time it will be about six months old. They like to sell the McChesney when it’s aged between six months and two years, even though it’s legal to sell when it’s sixty days old. This is Andrea and she works with the Owens on the farm. This behind the scenes tour was just fascinating! And I loved hearing how they got started…its amazing how certain obstacles can become amazing opportunities. The goats are pretty adorable…but that recipe sounds INCREDIBLE! I love goat cheese, especially paired with fruit! Thank you, Monet! It really is a fascinating story and their cheeses are excellent. They are such a great family and doing the right things. I wish them much success going forward and I am sure it will happen. Maaaaaaa – these guys (and gals) are sooooooooo cute!! we have goats living just down the street from us and lemme tell you, they are HILARIOUS!!! I bet that cheese is to die for! The goats are sooo cute! That was lots of fun to visit their dairy farm. I want to live there! Seriously… I do. These posts are absolutely wonderful to read! Your writing and photos are beautiful… and I have learned so much from them. I can’t wait to read more! Thank you for your comment, Brian. I appreciate that you are enjoying reading them. They sure are a lot of fun to do and I am learning right along with you! That’s a serious RV! 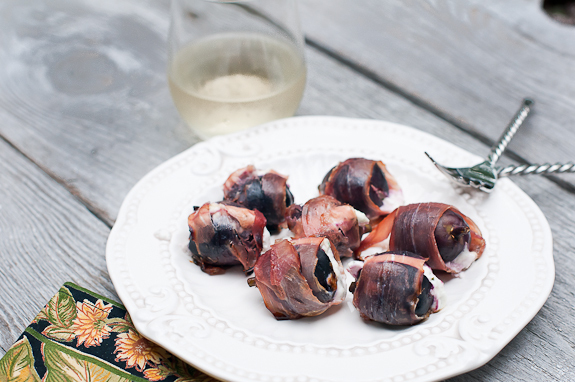 These figs stuffed w/goat cheese and wrapped with thin slivers of prosciutto are calling my name. I have some goat cheese that deserve transformation into these tasty bites. I feel so bad that I have not had much time to respond to comments, but I really wanted to thank you for yours. 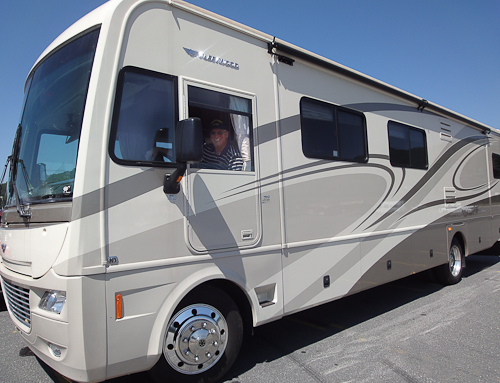 Yes, the RV was totally serious and deserves a post of it’s own…coming soon!! I know you had lots and lots of figs, so this recipe would have been perfect for your fig overload! Goat cheese and figs are just delightful together! Baked figs, prosciutto and honey? I’ve done other permutations–I’ll try this one next. Lovely photos and commentary–those goats are adorable! Oh, how FUN!! I would love to visit a goat/ cheese farm. I visit a lot of wineries but this is totally different. That’s awesome that you went out of your way to visit them, and thanks for sharing the experience and info with us. Great family, it looks like. I love those mom and pop operations. Growing up we raised goats for the healthier benefits of goats milk and they counted as a 4H project, too. 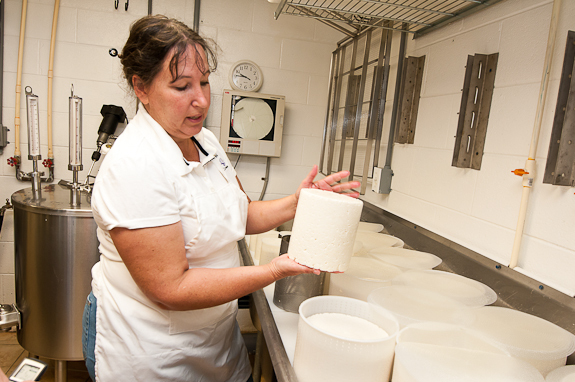 Our operation wasn’t anything like Spinning Spider Creamery’s – we milked our goats manually! Very interesting post, gorgeous photos, delicious recipe – I bet their goat’s cheese is amazing! All of the farms we have been to have been great family operations and the folks are just great. It has been so much fun getting to meet these people. Another super blog from Bunkycooks! That RV driver has to be extremely talented to travel up the road to Spinning Spider Creamery…. ! Great minds do think alike and we better enjoy the fresh figs while we can! Thanks for that. It was like going along on a field trip. This is a great post and recipe. I actually got some terrific goat cheese at the farmer’s market not too long ago, so I’ll have to see how my fresh goat cheese would taste in this dish. Thank you! We need to meet at some point since we are so close! I wish you could have made it to Atlanta a few weeks ago, but we will have to figure out a meeting up point and I am expecting some great Southern cooking on your end! What a lovely post, Gwen! Some of the goats behave like real actresses !!! Don’t you need some sort of personal asistante for your trips? (Me !!!!!!!) Oh, the figs are gorgeous !!! Personal assistant would definitely be welcome! The goats were very cute and knew just what to do. They were naturally photogenic. I bet they have been photographed a time or two. This one sounds like a real winner. We had figs and goat cheese app. in Napa a few years ago and I have been looking for this very combination. Can’t wait to try them. Thanks for the comment! This is definitely a Napa kind of appetizer. I know you will enjoy them with a great bottle of wine. I don’t know Gwen, you might have the makings of a new career here with animal photography. Those goats are absolute HAMS from the looks of it! Great adventure, beautiful post and a delicious recipe to boot…. Thanks! Thank you so much! I am enjoying the farm visits. Maybe I should switch “careers”, although the cooking is still the first love. I must say, this is a whole lotta fun! It really looks like a wonderful tour, I would have loved to been on. Goats kinda freak me out, but I have to say that they look cute in your photos and they make yummy cheese:) Those figs look so delicious and I could eat that whole plate all by myself, hehe. It must be so much fun traveling in your RV, I’ve always thought it’d be so cool to drive to and stop anywhere you want. Why do goats freak you out? They are really friendly and yes, they do make excellent cheese! 🙂 “Fun” is not exactly the word I would use for traveling in an RV, but it gets you there (if you can find a way to get that big thing where you need to go)! Thank you for the comment. Spinning Spider Creamery definitely has beautiful artinsal cheeses. I even had some at a restaurant yesterday! Hey, I’m in Asheville and buy Spinning Spider every week at the farmers market! I can vouch that it is amazing cheese…AMAZING! Great post and recipe! Haha, the goats look so well behaved! Very unlike how I imagine goats to be, eating the washing off the line and running away with the veggies from the garden. I love this recipe too. It should be illegal to go for too long without eating cheese stuffed figs. Delicious. thank you for this lovely recipe:) everything on this post looks like a lot of fun! and i love the pictures. great shots! How fun that was to read and look at! Thanks so much for allowing us to live vicariously through your travels. My uncle-in-law owns a dairy farm so while I’ve not milked a goat this way, I’ve cleaned cow udders and hooked them up to the sucking machines. They’re much dumber and nastier than goats though so I think I would have preferred what you did (especially since I had to muck the stalls after milking). As someone who buys cheese from Chris & family, I can vouch for how delcious it is. I get the added advantage of buying large quanities and then bring it back to Atlanta to sell to local restaurants & retailers. Cheese mule extraordinaire, that’s me! Great pics, wonderfully written article thanks for spreading the word, Chris deserves it. Thank you for your comment. Chris and her family do deserve recognition for their contributions to the community and for their great cheeses and other goat milk products (the yogurt was so good!). It was a pleasure visiting their farm and the goats were awfully cute (especially Colbert!). Keep those cheeses coming to Atlanta! I actually had their Black Mountain Blue at Le Vigne (the restaurant at Montaluce Winery) over the weekend. It was delightful! Mmmm, you had me goat cheese :)!